You feel extremely lucky to have him in your life and now you want to find a gift that shows him how much you truly care. Whether you are celebrating your first date or the day you said “I do”, an anniversary is one of the most special days of the year for any couple. While it may seem difficult to surprise him with a gift that will make him feel loved and appreciated, we took the time to curate a list of anniversary gift ideas for him to help you figure it out. If there is one thing you know for sure, it is that your man thoroughly enjoys sharing a fancy bottle of wine with you. Purchase his favorite vintage and dress it up in the Special Date Wine Bag to commemorate a day that will be remembered for a long time. It’s important for him to have constant reminders of the love you share for eachother. For a spark to renew your passion on this anniversary, include the most romantic photo you can find to be displayed in the Hand-Lettered Love Curved Glass Print. Tell him place it near a window in his office as the photos are translucent, which allows light to shine through. Add a touch of elegance and romance to your anniversary gift this year. 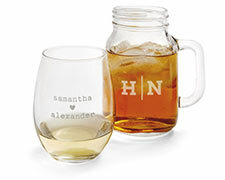 Get him a couple of Perfect Pair Heart Stemless Wine Glasses with both of your names etched on the sides. You can then create a new tradition when you two agree that the glasses will only be used on the most special occasions. Wow him on your anniversary this year with a gift idea that will shine above the rest. Select four nostalgic photos, perhaps from your engagement shoot or your wedding day, to be featured on the Modern Love Metal Wall Art. With a brushed metal surface, a silver basecoat will appear through the other colors, creating a defined metallic finish. Think back to one of the most inspirational trips you two have ever been on together. Maybe it was an island getaway to the Caribbean or a ski trip to the Rocky Mountains. Once you decide the location, find a wide landscape photo to put into the Gallery Panoramic Canvas Print so that his dreams remain big and widespread. He’s known to be a bit of a connoisseur when it comes to speaking about the newest seasonal craft brews being released. 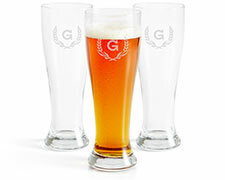 Make him extra cheerful on your anniversary when you serve him one in a personalized Diamond Monogram Pilsner Glass. There’s something about having your initial sandblasted on the glass that makes it taste that much better too. Whether you are enjoying a summertime picnic at his favorite park or snuggling up on the couch before watching a movie on Friday night, a fresh woven blanket is a gift idea that will be put to good use. Include a photo from a special moment during your relationship and pair it with the stylish background on the Tribal Frame Woven Photo Blanket. No matter how many years you’ve been together, let this anniversary serve as a significant milestone in your relationship. Find the most sentimental photos available that depict how your love has evolved during your time together. Organize them into the Love Always Photo Book so he can relive the memories anytime he wants throughout the year.